The Town of Louisa Police Department and the Louisa County Sheriff's Department are well-equipped and provide the community with all policing services. The County employs thirty-eight full-time Deputies in several divisions including patrol, investigation, special operations and animal control. The Sheriff’s office is dedicated to protecting residents and visitors to the county. As with many other rural communities, law enforcement is involved in the community and seen as allies. You’ll feel safe in Louisa County. Louisa County’s Department of Fire & Emergency Services is passionately committed to protecting its residents and those passing through the county. Firefighting and emergency response in Louisa County is delivered by a full-time, paid fire and EMS staff in addition to seven volunteer fire departments and five volunteer rescue squads. 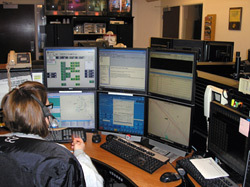 The County Sheriff's Office operates a 9-1-1 operations center and coordinates communication with fire and rescue departments. In a close-knit community like Louisa County, volunteer fire departments and rescue squads go the extra mile to assist fellow residents, and the community has a special appreciation for these volunteers. Emergency preparedness is paramount with all fire and EMS departments, but more so in Louisa County. Since the North Anna Nuclear Power Station is located in the county, Fire and EMS regularly plan and prepare for emergencies under the Radiological Emergency Response Plan.